Yesterday was the day of the first annual Holiday Mashup and it was amazing! If you weren't able to make it, no worries. You can see a recap of all you missed here. Also, we will be having plenty more events in the future! The pre-event started super early! Edward Lifegem was in the commons at around 5am CDT and he told me people were already starting to show up. Where was I? Sleeping of course! However, I did make it onto the game at around 9:30am and there was A LOT of people there already! Seriously all you early risers, your support for the events means so much to me, Edward, Michael, and Sarah! Edward the 4th of July Santa and Autumn the Santa Witch! 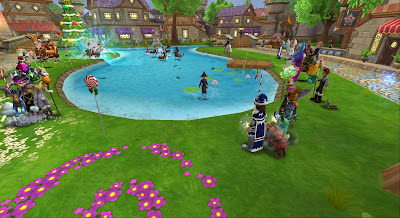 The stream and activities started at 12pm CDT. Edward and I started off the stream with our signature whisper-opening, because...well...why not? :P Then we had a dance party while we explained more about the event to our viewers. Dancing to Twenty One Pilots anyone? 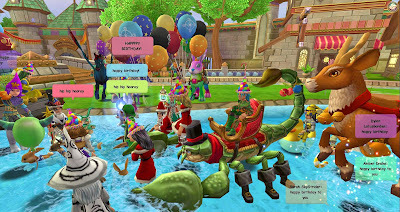 :D After that, we had a transformation party where everyone chose their favorite transformation. We talked about some of the contests we were having, such as the video guide contest (Congrats Terri Mistweave! ), the #HM2018Ideas contest (Congrats to all 11 of those winners! Click the link to see all the entries! ), The RT contest, and the keyword raffle! Wow, that was a lot of contests! On top of that, our twitch moderators were giving away codes in the stream chat! The next part of the event is one of my favorite things that happened yesterday! 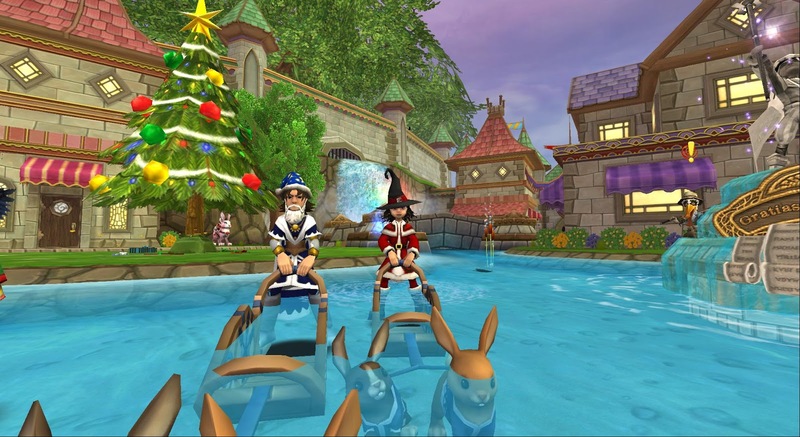 We went around to different realms and locations in Wizard City and did some Christmas caroling! This is always an extremely fun thing to do. Unfortunately, I couldn't participate yesterday because I was getting too much lag and had to prepare for Hide and Seek, but it was still fun watching everyone on stream! And after put on our birthday hats and met back up in the commons to sing Happy Birthday to Edward Lifegem! Yes, yesterday was his birthday, so if you didn't get to say happy birthday, make sure to go to his twitter and wish him a happy belated birthday! Happy birthday again, Edward Lifegem! I hope you enjoyed all of our singing! 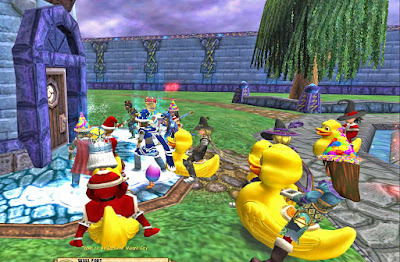 After all the singing, we had a holiday-themed hide and seek, one for each of the six main holidays we have events for. Congrats to all those winners, who won prizes such as packs, mini-games, and even a mount! 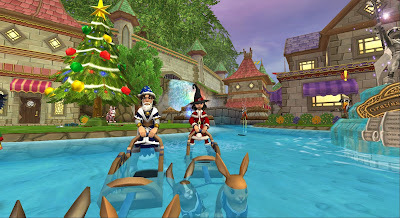 Then we did holiday pet derby racing, which was a lot of fun even though I lost really badly. I guess I should practice some more! Finally it was time for the countdown leading up to the run, but first, we had a surprise for everyone. 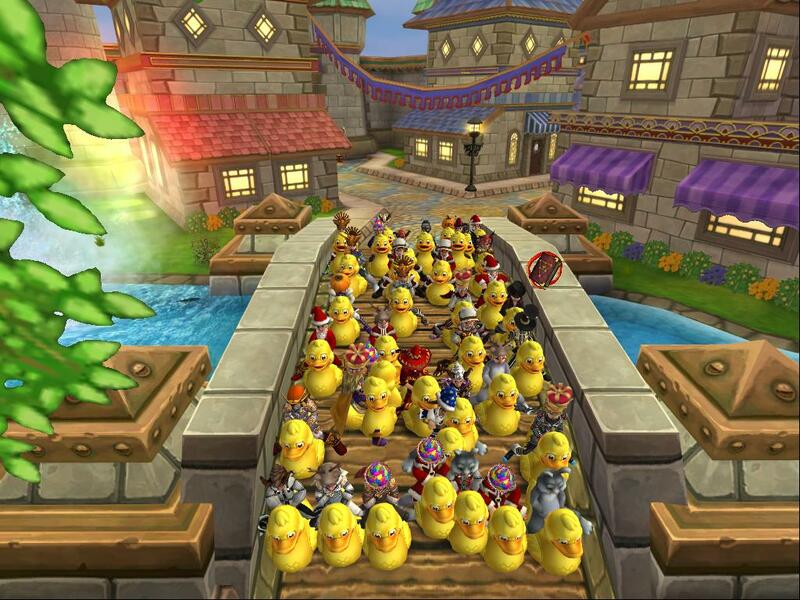 Tom, the community manager, had given a code for everyone to redeem for a rubber ducky mount! 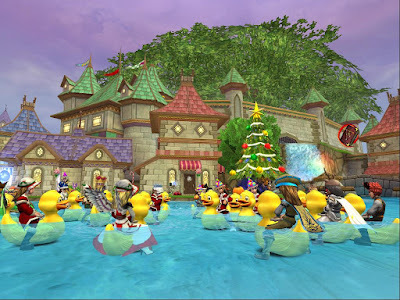 The rubber duckies are absolutely adorable and swarming the pond with them was so much fun! Rubber Ducky, you're the one......or thirty! Soon enough it was time to get ready to run...or bounce! We all lined up on the rainbow bridge, which made for some pretty cute pictures! Then it was off to run the course and fight some bosses! 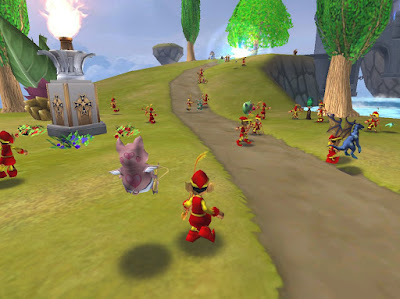 We ran through all the free areas of Wizard City and fought pretty much every boss we came across. We even rode the carousel and possibly mentioned mashed potatoes quite a bit. I have no idea who thought that up...Anyway, this was one of the longest run paths we have done so far, but it was so much fun! After the run, it was time to go to the houses Michael and Sarah had decorated for the after party. There was a maze, some housing games, and even pvp! Sarah and Michael both did a great job decorating their houses and helping to host the event. Overall, I think this was tied as one of my favorite events so far. I think everyone had a great time and there was so much to do throughout the day. You can see more about the entire day if you watch White Tiger's video below. Michael who is an awesome co-host and helped mod the twitch chat. Sarah who is another amazing co-host and helped port people. White Tiger who helped port people and made the awesome video above. Gabby who helps moderate the chat and hosts trivia and contests there. Cameron who helped us port people to the after party houses. Be sure to follow the twitter accounts of everyone linked here, either in the photos or the list above. They are all amazing community members! 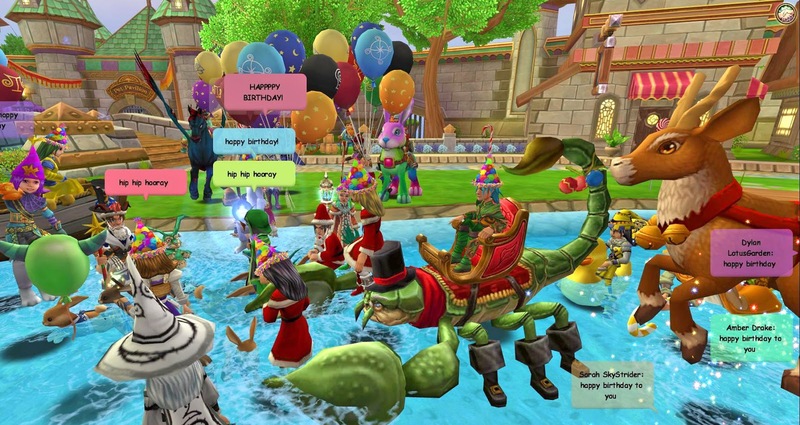 I would also like to give a shoutout to Victoria Thundershard who helped out quite a bit porting people and spreading the word about the surprise birthday hats. Also, thank you to everyone who showed up or helped spread the word. 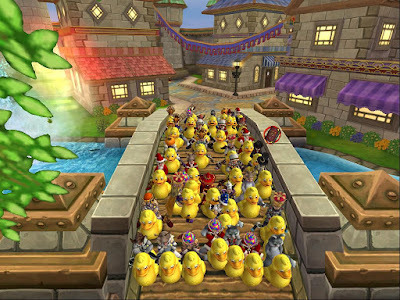 And last nut not least, thank you so much to Tom and Kingsisle for providing us with codes and supporting the events! You are all amazing! While we announced some contest winners during the stream, others will be announced on Twitter over the next few days, so be sure to watch @SecretsOTSpiral and @AroundTheSpiral for the announcements! This really was such a fun event and I hope all of you think so too. I cannot wait until the next one! Speaking of that, we announced our next event, the Halloween Run, at the end of the stream yesterday. You can see the information about that below. Each event we have seems to get better and better so I hope to see you there!